The man who founded Westboro Baptist Church and made “God Hates Fags” a thing is almost dead, according to his son. Fred Phelps has been ex-communicated from Westboro and is “on the edge of death” at a hospital in Kansas, Nathan Phelps wrote in a Facebook post Sunday. Nathan, an LGBT activist who left the church, didn’t say what’s ailing his father. A spokesperson for Westboro confirmed to Bustle that Phelps has “health problems,” but denied that he’s on his deathbed. 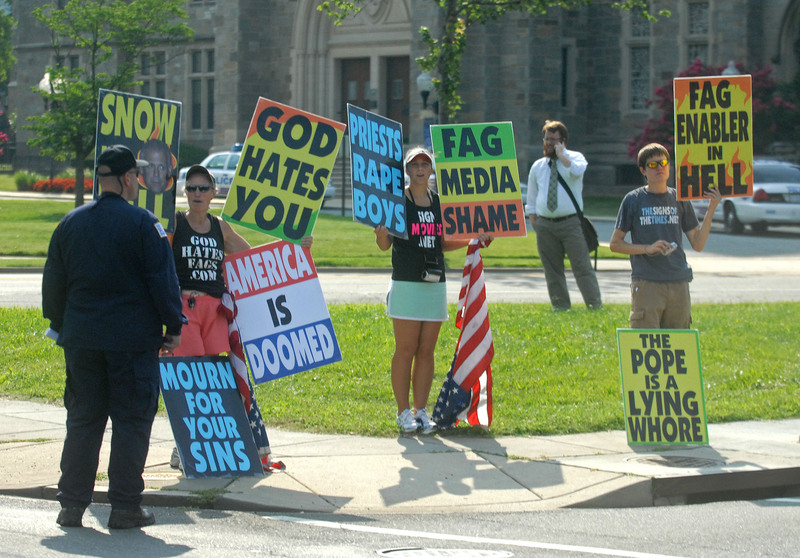 Phelps founded the Westboro Baptist Church in 1955. It has around 40 members, most of whom are part of the Phelps family, but has consistently attracted national attention both for its outspoken anti-Americanism and a virulent brand of homophobia that makes Vladimir Putin look like Harvey Milk. Classified as a hate group by the Southern Poverty Law Center, WBC’s highlights include screaming “God Hates Fags” at military funerals, thanking God for the Boston Marathon Bombings and, perhaps most disturbingly, indoctrinating its child members with the church’s ideology.